To say dates in English is quite simple. However, as there are two ways to do this, students often get confused and mix both of them together. I hope that this post will help them clarify this extremely important area. 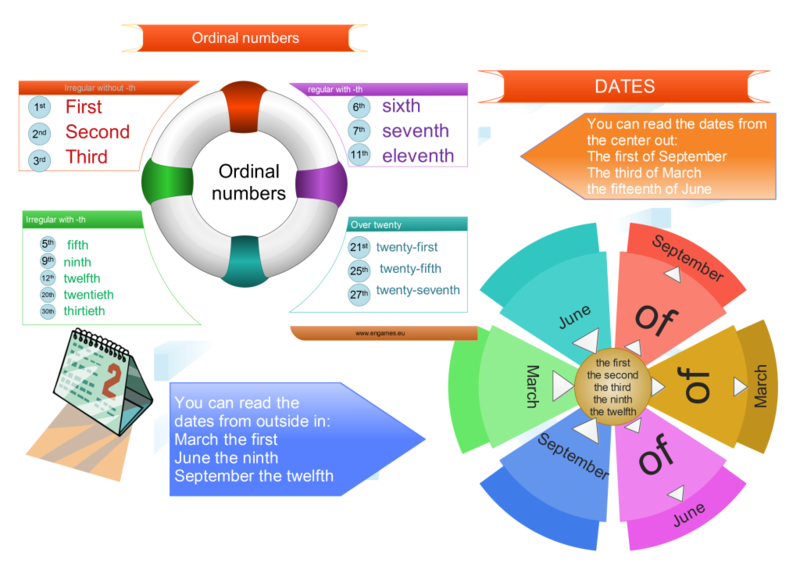 To be able to say dates in English correctly, it is necessary to know the ordinal numbers. Most of the ordinal numbers are made by adding the ending -th. (If you have a problem with this sound, I strongly recommend this BBC video) However, as always, there are several exceptions to this rule. The rules are explained in ther upper right corner of the mind map. Notice the way the change of spelling of the words twenty and thirty. In English there are only two ways to say dates. You can either start with the month and then say THE and the ordinal number, or you can say THE + the ordinal number + OF + the month. Do not mix the two ways!!! Once you have studied the mind map, it is time to practise everything. In the first game you have a chance to practise all the ordinal numbers. Your task is to shoot all the invaders and from time to time write the given ordinal number. There are all the ordinal numbers which you will ever need to say date. In the second game, called On target, your task is to choose the correct way a given date is said. I believe that if you play this game twice or three times you will learn the correct way to say the dates. If you come to this site using a mobile device you might hate the fact that most of the games do not play there. That is why I am trying to add a few HTML5 games to play even there. Here is one of them. All the materials in this post have been tested in the classroom and they have been improved on the basis of students’ reactions and suggestions. I hope that you will find them useful. If you study dates, you might need to improve your NUMBERS too. You can find a post on numbers here. Excellent and very useful. I highly recommend it for teachers and people willing to learn and/or improve their English skills.